← Should you get solar now, or wait? I found this article this morning and thought it might be helpful to everyone who puts Christmas lights on their house. It explains that it is very easy to put up lights by connecting them to your gutters. Enjoy and Happy Holidays from Roofmax! 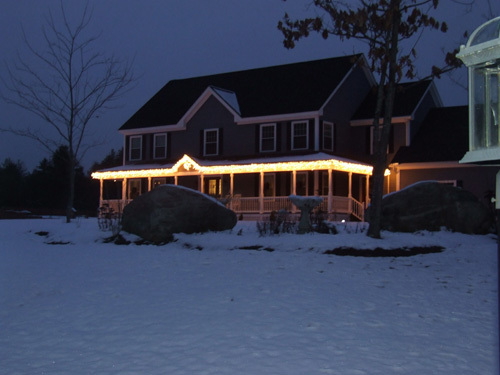 “Attaching Christmas lights to your home can be quite simple if you use the correct approach. 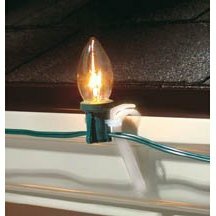 There are quite a few light holders on the market that make it very easy to attach your Christmas lights to gutters, roof shingles, siding and even fences. Most of the Christmas Light Clips are generic and allow you to hang the lights from many different types of materials. We really like using plastic light holders/clips because they securely hold the lights in place without damaging your home. In the old days folks used to nail, screw and staple lights to the trim of their home. Today, there simply isn’t a need to resort to those methods with all the generic plastic light holders being sold. Installing the light holders on gutters and roofs is really easy. The clips either snap over the top of the gutters front edge or you can slip the plastic holder under the edge of the shingles (it’s held in place by friction). There is a secondary clip that holds the string of lights. Most of the light holders will work with all kinds of Christmas lights including C7 and C9, mini, icicle, rope, specialty and LED’s. This entry was posted in Facts & Guides, home improvement and tagged christmas, gutters and downspouts, home improvement, lights. Bookmark the permalink.